Clinically proven formula: all-natural and no drugs. Naväge® SaltPod® saline concentrate capsules are a scientifically formulated combination of pure sea salt and purified water. When a SaltPod is placed in the Nose Cleaner crushing chamber and the lid is closed, the SaltPod concentrate bursts into the upper tank's warm water and immediately dissolves - creating perfectly balanced isotonic saline in the same ratio of salt to water that occurs naturally in your body. Doctors agree that isotonic saline is the basic building block for nasal irrigation. Naväge SaltPods make cleaning your nose as easy as brushing your teeth. Our patented system eliminates the measuring and the mess, and the uncertainty that go with it. Fill the Naväge Nose Cleaner with water, insert a SaltPod, close the lid, and in moments you have perfectly balanced saline - every time. Pure ingredients you can trust. 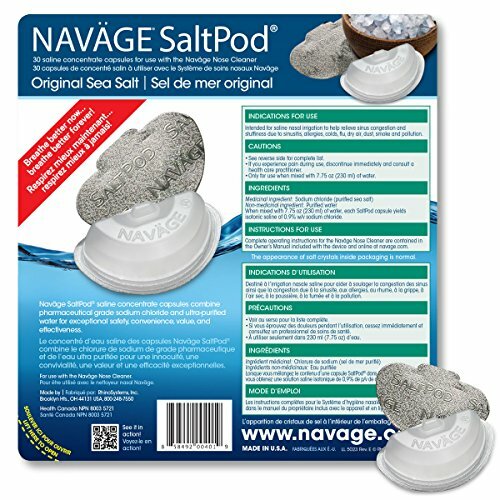 Naväge SaltPod capsules have two ingredients: pharmaceutical-grade sea salt and purified water. The water goes through a multi-staged purification process that includes carbon, deionizing, polishing and sub-micron filtration stations, as well as UV sterilization. The result: seriously pure saline concentrate. Naväge SaltPods are manufactured in our Cleveland, Ohio facility certified to comply with ISO 13485:2003, the internationally recognized quality standard for medical device manufacturing. 30 saline concentrate capsules for use with the Naväge Nose Cleaner (sold separately). Scientifically formulated concentrate of pharmaceutical grade sea salt and purified water. Yields 8 ounces of isotonic saline (0.9% w/v) when mixed with 7.75 ounces of water. Fast, soothing relief from sinus congestion without drugs. Naväge SaltPods are Nature's Decongestant®. If you have any questions about this product by Navage, contact us by completing and submitting the form below. If you are looking for a specif part number, please include it with your message.